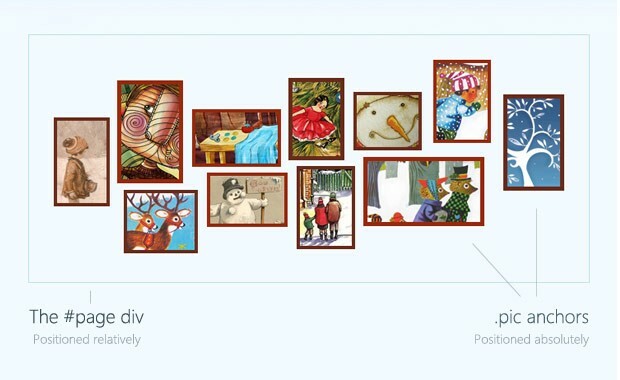 This holiday season, Google once again lifted up the Christmas spirits of those, who visited their homepage, with their animated logo, or doodle, as they call it. Now, with the holiday behind our back, we can put the calories from that lavish diner into good use, and try to get in shape for the following week. So lets try to recreate Google's animated logo with the help of jQuery and a bit of CSS! The image has to appear fixed in one place during the duration of the animation. This means that we have to update its offset (by using the margin properties) on every step of the anchor's animation. This would require animating two distinct elements at the same time with perfect synchronization, otherwise the images would jitter. The CSS code is minimal, as we only need to style the #page div and the .pic anchors. I am using the nth-child CSS3 selector to target specific elements and to apply darker and thicker borders. As this is mainly for presentational purposes, the script would still function correctly in older browsers with no CSS3 support. // as arguments, so we need to calculate them. The pic function above is the constructor for our class. As you will see in a few moments, we are going to create a new object of this class for every expandable image on the page. When called, it creates the the markup you saw in the first step, and stores it in the this.elem property as a jQuery object. This means that we can use the elem property as a regular jQuery object, along with all the method the library gives us. // that are common for all objects. // The step funciton is executed on every animation frame. // between 0 and 100. Below we are turning it into percentage. The prototype property holds the common methods that are used by all pic objects. open, close and focus are wrappers around the expand method, also defined in the prototype. This method takes a percentage as its only parameter, and expands the pic to the specified size (100 percent corresponds to the size of the completely shown image). As mentioned in the beginning we cannot bind events to the expandable pics. For this, we have two more interesting methods - near and over. These take the x/y coordinates of the mouse pointer and return a boolean expression indicating whether the mouse is near/over the current image. You will see how this is used below. // Setting up an event listener for the window.load event. // window.load is executed after all the images have been loaded. // and check whether the cursor is above any of them. // foce a close on all the images. In the code above we are filling the picArr array with pic objects, after which that we append them to the #page div. Later, in the window.load event, we bind a listener for the mousemove event, and check whether the current mouse position is above any of the images. If it is less than 15 pixels from an image, we focus it, and if it is directly above it, we run the open method which shows the full image. Our Google-like Christmas Logo is complete! You can use this script in dynamic headers, product demos, tours or slideshows. By passing different parameters when creating the pic objects in script.js, you will be able to customize just about every aspect of the script. As it detects the sizes of the images automatically, you can easily change them without problems. That is pretty much it. Now that we are up to speed again, we can all have a productive week before being derailed by the next holiday round right around the corner. Really Nice! Your website inspire me! Thk's a lot! Simply...awesome! You rocks. Thanks for sharing. whats the fonts on the logo of this title?? "Christmas Doodle"
This is amazing...you guys rock! The Design of the page is amazing also...The Details are so coooll!!! Haha, nice and quick job! Merry Christmas and thank you for this amazing tutorial! Just one question, is it possible to achieve this effect but instead of square to have circles? Yes, it is possible to turn the images into circles. Some parts of the code will need a rewrite, however. I will not get into much detail, but you will need to set the image as a background of the anchor, and use the background-position animation plugin to move it, instead of using top/left and margin properties. After this you can use the border-radius CSS3 properties to round them. I will try to transform it into circles, I will let you know of the result! Is it possible to add a url link to each image? I had a quick question. Can you point me in the right direction to figure out how to add a click command? Meaning instead of pointing to a web address when the user clicks one of the images I'd like it if when they clicked I could open a third image on top of the collection that had a specific text message. Like Happy Hanukkah or if they clicked another image, another image would appear that included Merry Christmas etc.